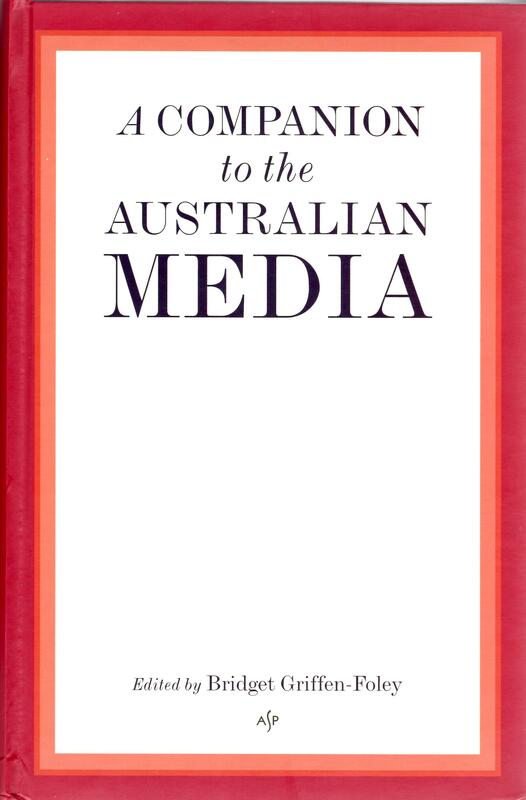 The long-awaited book, A Companion to Australian Media, is now in print and available. Edited by Professor Bridget Griffen-Foley, it is published by Australian Scholarly Publishing (North Melbourne). I am one of more than 300 contributors to the “Companion“, and wrote the entries on film reviewing and educational media. I joined an august group in this massive project, which is the result of many years of work by Professor Griffen-Foley, as the result of an Australian Research Council Discovery grant. The book retails for $88.00 (Aust): with about 415,000 words and 543 closely packed pages (including an impressive 37 page index), it’s great value. First entry: “A Current Affair”; second entry is “Phillip Adams”; and the last entry is “Zines”. You can listen to Bridget Griffen-Foley discussing the Companion, on the podcast of ABC Radio National’s “Media Report” program, broadcast on 9 October 2014. A photo of the book cover is below. I am proud to be a contributing author to the upcoming “A Companion to the Australian Media”, to be published by Australian Scholarly Publishing and released in September 2014. It’s edited by Professor Bridget Griffin-Foley (Macquarie University), and has an eminent editorial board. It also has a whopping 479 entries totalling more than 415,000 words written by 300 contributors, including Quentin Dempster, David Salter, Eric Beecher, Tim Bowden, Mark Day, Gerald Stone, John Faulkner, Graham Freudenberg, Ross Gittins, Gideon Haigh, Sandra Hall, Jacqueline Kent, Valerie Lawson, Sylvia Lawson, Peter Manning, Bill Peach, Nicolas Rothwell, Julianne Schultz, Margaret Simons, Graeme Turner and Richard Walsh. I wrote the entries on “film reviewing in Australia” and “educational media in Australia”. An article by Peter Coleman about the “Companion” appeared in the May 31, 2014 edition of The Spectator. At this time of rapid and revolutionary change in modes of communication, A Companion to the Australian Media provides the first comprehensive, up-to-date historical account of Australia’s press, broadcasting and new media sectors. Arranged in an accessible A–Z format are nearly 500 articles focussing on both the history and contemporary practice of media corporations, individuals, industries, audiences, policy and regulation since the launch of Australia’s first newspaper in 1803. There is possibly nobody else in Australia who has tried to monitor, capture and report on the changing nature of journalism in the digital age than Margaret Simons. A veteran journalist (The Age, The Australian), for some years she lectured in journalism at Swinburne University of Technology and is now director of the Centre for Advanced Journalism at the University of Melbourne. She also founded and continues as the guiding light of The Public Interest Journalism Foundation (declaration: I am on the Foundation’s Board – I believe strongly in its mission), an organisation that “promotes and enables innovation in public interest journalism”. 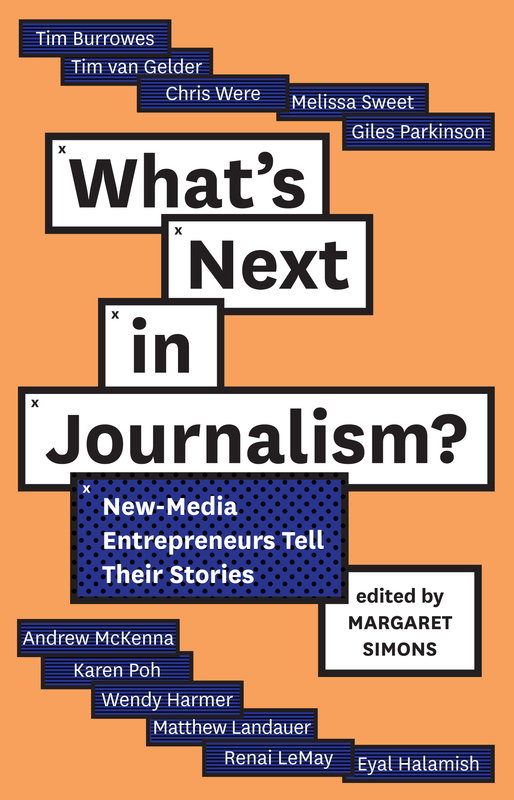 Simons’ latest book (as editor) – What’s Next in Journalism? New-media entrepreneurs tell their stories (Scribe) has just been published, and is as definitive as snapshot as you can get – in print, no less – on the rapidly evolving digital media landscape. With a genuine explosion of material on this topic, the big value of What’s Next in Journalism is that it encapsulates what’s happening here in Australia, all within a globally aware context. And while you are on the Public Interest Journalism Foundation website, have a look at a well-written blog post by Dr Tim Senior, a General Practitioner who works in Aboriginal health, who responds to an outstanding recent public lecture by Katharine Viner at University of Melbourne last month (October) entitled, “The rise of the reader: journalism in the age of the open web”. Feature writing is not like news writing. The structures and styles are both different, with rules of their own. What writing students often don’t realise is that in the feature article the most important parts are the opener and the closer – unlike the classic news article with its inverted triangle structure. You need a strong hook at beginning and a “pot of gold” ending. And short sentences help. A lot. Yesterday’s The Sydney Morning Herald (26 August 2013, p. 19 of the paper edition) included a good example of classic feature writing by Vic Ahladeff, the CEO of the NSW Jewish Board of Deputies. In an article entitled “Kings dream just a sleeper but for Mahalia Jackson”, he writes about the 50th anniversary of Martin Luther King’s “I Have a Dream” speech. 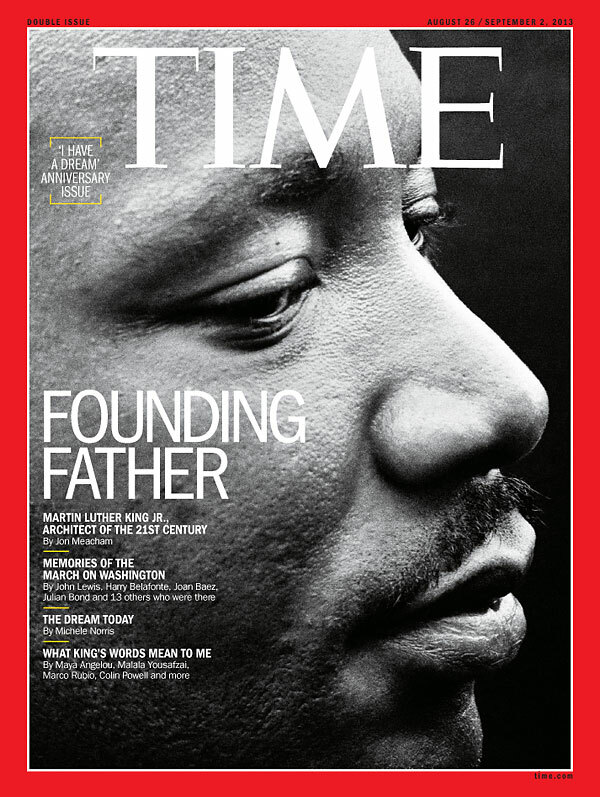 Others have noted this: it’s on the cover of this week’s Time magazine. But Ahladeff’s article takes one angle: that of African-American gospel singer Mahalia Jackson’s role in encouraging King to use the “dream” theme. So after teaching feature writing to university public relations and journalism students twice in the last 18 months (University of NSW and APM College, North Sydney), I find this article to be an excellent example for students. Here’s why. If anyone warrants a footnote in history, it’s Mahalia Jackson. (10 WORDS, CATCHY) If anyone deserves a modicum of recognition for what transpired before 250,000 people crammed at the foot of Washington’s Lincoln Memorial on a sweltering afternoon 50 years ago, it’s surely Mahalia Jackson. Comment: First sentence, catchy. Ten words. Second sentence 31 words, really too long, however he gets away with it because the sentence is evocative and he uses the repetition technique – mirroring the first sentence – at both the beginning (“If anyone deserves …”) and the end of the sentence – “it’s surely Mahalia Jackson”. Yet her story remains unsung, her involvement in one of the greatest speeches of all time unheralded. Comment: One sentence, which runs 17 words, and it is the “real catch”, placed just where the article most needs it. He throws the reader’s attention to the rest of the article. Wow, the reader thinks. Really? Tell me more. What was her involvement, they ask? King was assassinated in 1968. Jackson sang Take My Hand, Precious Lord at the funeral. She died four years later, 50,000 people filing past her coffin to honour the queen of gospel whose unforeseen outburst paved the way for an oratorical masterpiece whose eloquence reverberates 50 years later. Comment: First sentence of the paragraph is only five words long. Shocking. Assassinated. Yes, we knew. But still. This is the first mention of King’s untimely death. Second sentence – nine words, the connection is made again – she actually sang at the funeral. Third sentence – she died four years later – oh goodness, she died too. “The queen of gospel” is a nice phrase. The final sentence is a little long but it reads very well. It contains only two real adjectives – “unforeseen” and “oratorical” – both of which work well and do not duplicate their nouns, as so many adjectives and adverbs tend to do. The “50,000” and “50” numbers also create a parallelism. The words “eloquence reverberates 50 years later” give us a sense of history. Overall, the sentence makes us feel good about ourselves in that we are, somehow, a part of that “reverberation” and a part of that “history”. Convinced? Read the full article, especially since it is available online free in its entirety (at least as of Tuesday 27 August, morning in Sydney). It may not be freely accessible for long, given the recent massive changes in newspaper business models.